On 24th January 1536, at a joust at Greenwich Palace, fourty-four year-old King Henry VIII suffered a fall, either falling from his horse or his horse stumbling and both of them falling. The primary sources differ over exactly what happened and the seriousness of the accident. Although some history books, websites and programmes suggest that Henry VIII suffered a serious head injury which may have caused a personality change, two out of three accounts of the accident say that the king was not seriously hurt. You can read the primary source accounts in my article from last year – click here. I’d love to know your thoughts on this. 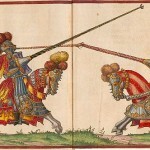 You can read Sarah Bryson’s article on jousting, and what it involved, over at the Tudor Society website – click here. While we’re on the subject of jousting, also on this day in history on 24th January 1555, in the reign of Queen Mary I, there was a great joust held at Westminster between English and the Spanish knights. The diarist Henry Machyn records that there was “grett ronnying at the tylt at Westmynster, with spayrers [spears], boyth Englys men and Spaneards”. I speculate that it would have embarrassed the Great Harry to incur such a spectacular fall from horse but it surely did, the mishap understandably downplayed by his supporters. Loss of consciousness would not be unusual. Whether or not his personality underwent a change for the worse, who knows for sure? I never thought he was a nice guy to begin with. But it would have given us all sorts of other issues to discuss. Civil war, for one. Can you imagine Mary would have stood by and let Elizabeth (with Anne as Regent) take the throne? And how many people would have gone over to Mary’s side, preferring a grown woman to a two year old? Foreign interference would be almost a given, I suspect, given Mary’s ties to Spain and the HRE for starts. And what about Fitzroy? Would he be a player? Or perhaps you would prefer assassination? So lots to talk about, just different stuff! My comment was made very tongue-in-cheek Dawn Rose. There would be plenty of other things to learn about, but would Tudor history still have the big pull it has without Henry’s marital escapades, those fascinating personalities, the romance and the brutality…l reckon if you asked anyone what they know about Tudor times ,that 9 out of 10 people would say Henry Vlll and his wives, asked to name one, it would be Anne Boleyn. l definitely was drawn in by them when l was a teen, many, many moons ago, and my interest developed. Not to scholarly levels as Claire and other bloggers by any stretch of the imagination. As l said the whole dynamics of that time would be completely altered, the religious and power battles would continue there is no doubt about that, but would they incite the same interest…can l ask out of interest what got you interested in this period of history. True, true. As to what got me interested, it was a juvenile book called “She was Nice to Mice” by Ally Sheedy, followed up a few years later by “Young Bess” by Margaret Irwin. Went backwards through English history (1066-1603 is my rather long time period), but the Tudors remain my primary interest. I have read Young Bess too, as a teen, it’s still on my bookshelf, along with the other two Elizabeth the Captive Princess and Elizabeth and the Prince of Spain, did you read those too? Did you know Irwin also wrote ghost stories, which l haven’t read, and used to be ghost story mad too. Its a very captivating era the Tudors, and l think it always will be. And how people interpret them is fascinating too. Oh, yes, I have all three of the Elizabeth books. Haven’t read any of her other ones. What’s become interesting to me is how modern concerns are apparent in them. “Young Bess” was written during WWII and was very patriotic in places to bolster British pride/morale; “Elizabeth and the Prince of Spain” was published in 1953 and carried hopes (I think that might be the best word) for a second glorious Elizabethan age. I’ll admit they don’t jump out at you, but I’ve been reading these for 30 years or more and slowly I caught some of the undercurrents. I’d say the movie version of “Young Bess” (1953) performs the same job. I suppose that by little hurt they could mean obvious physical injury. Whether or not Henry was out for the court, it may have not been clear that he had a head injury and if he was unconscious for two hours, because he came too, the extent of his injury, which we now calculate to be the rattling of his frontal lobes would not have been known to his doctors. Perhaps the observers only thought that Henry had a mild leg injury, the severity of which did not become clear for some time. The information is certainly mixed, which, given that some is second and third hand is not surprising. Personally, given his personality changes and open ulcers from this time, I think he was hurt and had a head injury. Regardless, drama and film certainly go for the serious fall, it’s so much more Henry, never doing anything by halves.